An Official Publication of the Wound Healing Society, Advances in Wound Care provides a critical forum for the field of tissue injury and repair, with an emphasis on acute and chronic wound care to optimize patient outcomes. The Journal enables rapid dissemination of translational research from bench to bedside, with wound care applications including burns, major trauma, blast injuries, surgery, diabetic ulcers, ostomy, bedsores, and more. 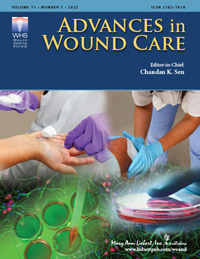 Advances in Wound Care is under the editorial leadership of Editor-in-Chief Chandan K. Sen, PhD, and explores novel research approaches and practices to deliver the latest scientific discoveries and developments. WHS Members in Good Standing get a discount when purchasing the Journal. Please contact the Publisher for further details.